We’re very excited to present our first Featured Business for 2015. We were with this business from the outset with their quest for a new laser machine which was acquired with the help of a brilliant Kick-Starter campaign, and have seen them go from strength to strength since. 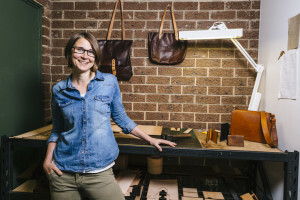 Starting off with creating bespoke leather goods by hand, and now supplying Melbourne and Australia a variety of gorgeous individualised engraved and laser cut leather goods using their brand new Trotec Laser. The Engravers Register can also vouch for them, with our manager’s Titanium Marketing & PR being fortunate enough to secure a couple of their gorgeous pieces! We can’t wait to see what 2015 brings them. Welcome Chocolate Brownie – don’t forget to check out their amazing online store! How did you get into business or get started? Through jewellery strangely enough. Some of my jewellery pieces were on show at a conference about new technology in craft and design. My pieces were representing what can be done with rapid prototyping. At this time I was just doing leatherwork as a side project. But it was here that I made connections with a local university, and was given the opportunity to try my leather patterns on their laser cutter. After my first attempt I was sold… I needed a laser cutter! And it’s been since then that I have been in pursuit of getting my own. 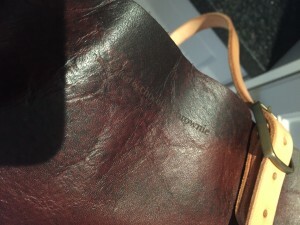 Leather… In particular vegetable-tanned leather. My art and design background… I have been involved in these industries/disciplines for 10 years now, and have developed a unique design sensibility as well as good understanding of a variety of materials and their properties. What is your favourite job you have done? 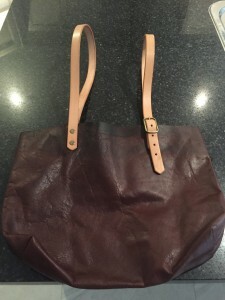 A custom leather briefcase… It was the beginning of me taking my leather goods to a new level of complication and quality. I want to make furniture! I’d love the opportunity to work on some beautifully clean and simple modular-style furniture. Finally, what is the all time favourite job you have seen? https://anilaagha.see.me/yearinreview2013 The work is called Intersections and its by Anila Quayyum Agha its absolutely exquisite. Our latest Featured Business is Australian and new to the industry, having only purchased their first laser machine, a Trotec Laser Speedy 100, earlier this year. Since then they have started to explore a range of niche markets, including a range of custom made items – to them nothing is impossible! We are very excited to see how QBik grows and what creations they make for clients. I was originally a Fitter and Turner, but after gaining a Bachelor of Engineering (Mechanical) I predominantly filled project construction management roles. I was becoming bored with the construction lifestyle and wanted to return to the joy of making things that I experienced as a machinist / technical officer. After playing around with a 3D printer and concluding that although a lot of fun, they were not promising to be economically rewarding for some time. 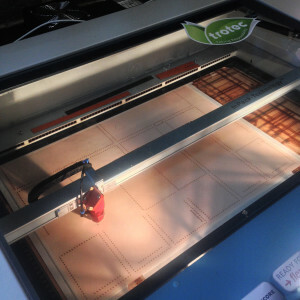 I then identified laser engraving / cutting as a complementary process that showed great promise. After a bit of homework, (OK a lot) I decided that I was going to focus on the best quality equipment I could afford so after visiting the Trotec Stand at Visual Impact in March this year I placed and order for my Speedy 100 and QBiK Creative was born. The Speedy 100 has since been joined by a Roland LEF-20 Versa UV Printer and a Roland DG MDX 540S 3D mill. Like the Speedy 100 these were also leading products in their area of expertise. My point of difference is the combination of equipment in the one workshop. I focus on low volume highly customized products and use the philosophy that if you can’t buy it talk to me as there is every chance we can make it. I have an engineering background so my strength is in fine tuning the processes and the clients bring the artistic talent. Apart from cutting and engraving I can print on many items and machine small items from anything from wax through to aluminium. I am also developing a small metal casting capability. What is your favourite job? My favourite projects are the large scale plywood orders such as the stacking coffee tables ordered by Ruby Caravan and the 1.5m cross I have manufactured to be mounted on a soon to be opened restaurant’s wall. Others of note were the order for Fluoro Orange and Pink Pinwheels and the 1.2 metre wide transfer applied to a tablecloth. They test your skill with stretching the boundaries of the equipment and it becomes personal. I don’t really have ‘A’ dream project… I have many. So I hope to work through them one by one. The first that comes to mind is putting together a range of Lampshades. This will let me play with geometric shapes and try out my skills at putting the pieces together. I have also been working with a local bronze artist to create bronze plaques and other items. I have cut a number of Fret boards for a local Banjo manufacturer and I am trying to convince him to let me engrave the backs of them. Finally, what is your all-time favourite job you have seen? That’s hard! Since I have started QBiK Creative I have become the kid in the candy store. Each time you see a ‘wow’ job you look further and there is another. I really do admire the architectural models. The Engravers Register is very pleased to present our next Featured Business – CNCROi.com. You and I know him better as Jon Cantin from CNCKing.com, one of the Engravers Register’s founding supporting sponsors in Australia / New Zealand. Jon has been very proactive and supportive of the Register, providing a range of quality content and projects. Jon has now returned to his native Canada, establishing his own laser business! We are very excited to be able to spend 5 minutes – we hope you enjoy the read. I’ve been designing for CNC machines (laser, router, 3D printers and plasma) for several years and decided it was time to get my own machine, circumstances worked in my favor on several levels though I had to make some serious sacrifices to make my dream become a reality. I just bought the machine and started in a new market from scratch without a client base then networked like crazy to build it up for CNCROi.com. As for CNCKing.com, it was a slow process of gradually releasing models and gaining attention from people within the industry. Unlike CNCROi.com that really only started a month ago, CNCKing.com has been in existence since 2008. Ironically, these two businesses couldn’t be further apart, one is helping companies, architects, designers and entrepreneurs and manufacturers with their etching, engraving, annealing, marking demands while the other is giving awesome designs for people with CNC machines. Where the two cross paths is that I can now video tape using my Trotec Speedy 400 flexx all the models on CNCKing.com. We have two areas of expertise, one is design, I own CNCKing.com which has hundreds of CNC designs available for people who have CNC machines make cool projects and the other is in industrial marking. I bought a Trotec Speedy 400 flexx because I knew industrial work is mostly all metal, hence the fiber would be in high demand and the CO2 would allow me to cut my models out of wood and acrylic easily. So far, this decision has allowed me to bid for projects that very few people can within my area – being able to do two different laser processes in one pass is a MASSIVE advantage, being the only one in all of Canada with this ability is an even larger advantage I’m taking full advantage of. We can essentially designing anything in the virtual world and bring it into the physical one without having to oursource any of the production required to make this transition happen. Attitude, anybody can buy a laser or CNC machine for that matter – not everybody can wake-up in the morning, call a company cold for a meeting a few hours later and then “drop in” to a dozen more around the same area. My self-taught experience in the design field means I can just as easily speak to a CAD designer as I can with an architect – in their language – and my business experience has helped me gain the confidence to meet-up with pretty much anybody and open their eyes to the possibilities CNCROi.com offers them. Being able to comfortably handle both ends of the stick (design and business) is a very unique ability that I’m taking full advantage of. I also spent years creating industrial 3D animations for manufacturers – the key client base I’m working hard on developing now yet again – so all of these synergies are creating a perfect environment for me. I wouldn’t call what I do a job in the traditional sense, I enable a designer to see his creativity in the real world, I enable manufacturers to meet parts identification requirements, I enable architects to explore new design possibilities, I enable retail shops to open up new revenue streams, I enable people to enjoy the delight that CNCs can bring to their lives. If anything, I’m an enabler and that’s by far the best part! I want to make a full-scale Moon car – my only limiting factor at the moment is physical space but once I move into a larger shop, that’s on the top of my list… I’m not sure where I’d put it after, I have a few ideas of people that I think would like to take it off my hands, but to me, spending a month sleeping next to my Trotec Speedy in the shop designing and cutting away would just be awesome! There is a certain kind of peace that comes from working on a massive project that challenges your boundaries of what is possible – it’s almost like a dream state where hours lose their presence and all you see is goal after goal being achieved. Finally, what is your all time favourite job? This may not be the “job” answer you had in mind but I’ve done a lot in my life, from publishing books to traveling the world, visiting manufacturing companies all across North America to showing-up in magazines and newspapers. By far my all-time favorite “job” though was working at Evright.com as it opened my eyes to the possibilities I’m now turning into reality here at CNCROi.com. Up until that point, I had only designed for CNC machines, never actually touched a laser and knew nothing about the engraving business – NOTHING! Everything was so novel to me, a showroom (??? ), production environment with a bunch of laser (??? ), awesome employees (??? ), it was like crawling out of a cave after years of hibernation. Beforehand, CNCKing.com was a completely virtual one-man company and I had spent the previous 6 years away from any real business related activities teaching rug rats ESL during the day and designing at night. The fact that Evright.com was located in Australia, a country I will settle down in one day, it was just an unbelievable opportunity for me all around. I was exposed to so many facets of the CNC laser industry that it’s tough to put in words how life changing the experience was and how hard it was to tell the management that it was time for me to go after two years of living in paradise. It’s one of those moments that you wished you could press rewind and do it all over again, with a few tweek of course! There isn’t a day that goes by that I don’t think about the places I’ve seen and the people I’ve met while working at Evright.com. The experience inspired me and without knowing it, lit the fire of entrepreneurship within me that layed dormant all those years and before long, it consumed me. Knowledge is a job that never ends. 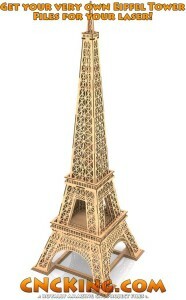 Oh yeah, design wise, my favorite project was designing my CNC laser Eiffel Tower design, it was quite a challenged making something so complex using so few pieces and I look forward to cutting it out in Acrylic with my Trotec Speedy 400 flexx! 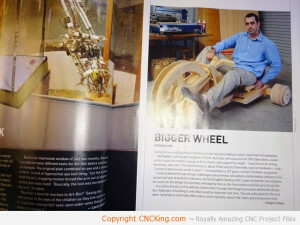 A very close second was my Wooden Big Wheels that was recently featured within the pages of Make Magazine – converting six full-sheets of plywood into a vehicle that moves is quite a challenge that I wasn’t sure I could meet… but I did!